If you have a service-based business that does not sell any products, choose Wave. However, if you sell products and need the ability to stay on top of supplier bills, Xero has few limitations. Unlike Wave, Xero includes automatic tracking of all inventory, the ability to print checks to pay your bills, and payroll processing. If you are a product-based business with employees, you should choose Xero. Xero is able to handle all inventory quantity and cost calculations for you so that you don’t have to manually do it. In addition, the Standard and Premium plans include payroll processing for up to five and ten employees, respectively, at no additional cost. If you are a service-based business or you have more than one business that you need to keep track of, Wave is going to be ideal for you. Unlike Xero, you can do bookkeeping for multiple businesses under the same account for free. If you have employees, you can add Wave Payroll for a monthly fee. 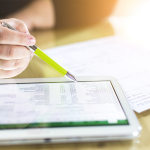 If you’re looking for an accounting software that you can set up on your own but you also want the ability to quickly get an answer if you get stuck, QuickBooks Online is a great alternative. Unlike Xero and Wave, most bookkeepers and accountants are familiar with QuickBooks; all QuickBooks plans include telephone and chat support. An accounting software should include a few basic features to be worth its salt. As part of our research, we looked at cost, ease of use and setup, the ability to create invoices and manage bills, the ability to give other users access to your data, and the ability to allow customers to pay online. Cost – the product includes a pricing plan that is affordable for a small business. Ease of setup/use – setup time is minimal and it is easy to navigate the program. Ability to manage accounts receivable – able to create invoices and track open balances. Ability to manage accounts payable – able to enter bills and keep track of unpaid bills. Give other users access – can give a bookkeeper and tax pro access to your data. Accept online customer payments – can give customers the option to pay bills online. Payroll processing – able to process payroll and make payroll tax payments. Inventory tracking – ability to track inventory purchases, sales and adjustments. After taking both Xero and Wave for a test drive and evaluating their ability to meet the above criteria, we have chosen Xero over Wave. While Wave did meet five out of our six criteria, it fell short when it comes to managing accounts payable. On the other hand, Xero not only met all six criteria, it also includes payroll processing in two out of their three pricing plans and it works great for product-based businesses that need to track inventory. 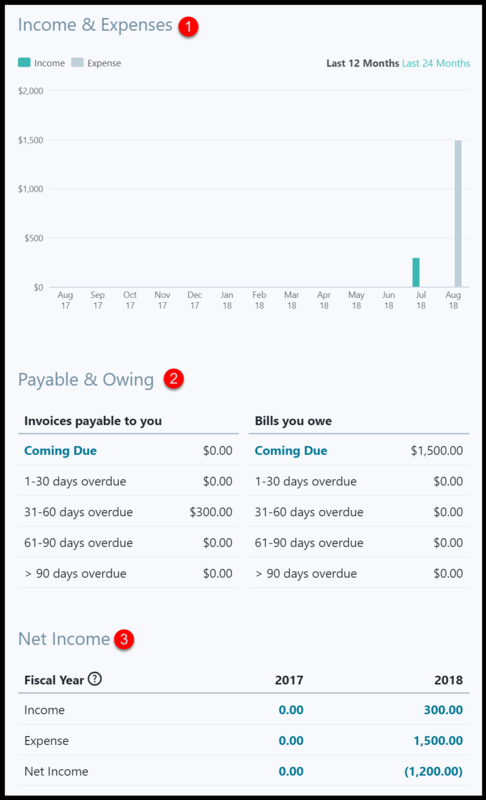 Xero and Wave both allow you to track your accounts receivable balances, invite unlimited users to access your data, and give you access to detailed financial reports like profit and loss and cash flow statements. However, if you don’t need payroll, Wave beats Xero hands down when it comes to price. Wave is free and Xero has three pricing plans starting at $9 per month. Wave also allows you to manage more than one business with one account and Xero does not. Xero has three pricing plans that run between $9 and $70 per month. All three plans allow you to invite unlimited users to access your data, manage unpaid vendor bills, and stay on top of open customer invoices. You can also run financial reports, such as Profit and Loss and Balance Sheet reports, to see the overall health of your business. The Standard and Premium plans include payroll processing at no additional charge. Unfortunately, the Xero Starter plan is just too limited for us to recommend to even a startup business because you will quickly outgrow this plan. This plan limits you to managing up to five bills per month and generating up to five customer invoices per month. It also does not include payroll processing and inventory tracking like the Xero Standard and Premium plans do. The Xero Standard plan is ideal for a service-based or product-based business looking for a plan that allows them to stay on top of their A/R and A/P balances and manage payroll for up to five employees without the need to hire an outside payroll service. The Xero Premium 10 plan is ideal for a business that is expanding their reach to do business on a global level. If you have customers in foreign countries or suppliers abroad, you can create invoices in any currency and pay your vendors in their native currency with Xero Premium 10. Similar to Wave, Xero has full accounts receivable functionality. This means you can create custom invoices, email invoices to customers and accept payments. You can also stay on top of open customer balances by running an A/R Aging report. Unlike Wave, Xero has full accounts payable functionality. This means you can enter bills, track their due dates and pay them all within Xero. You can also stay on top of unpaid bills by running an A/P Aging report. When it comes to giving other users access, Xero and Wave are identical. Xero allows you to give unlimited users access to your data. This means anytime you add a new user, you will not be charged for it. You can accept online payments from your customers in Xero but like Wave, you will need to add this service to your account. Xero integrates with several credit card payment solutions like Stripe and PayPal. You will need to select the payment solution that works best for you. Visit the Xero App Marketplace to see all of the options available. The Xero Standard and Premium 10 plans include payroll processing at no additional cost, whereas Wave does not include payroll but you can add it starting at $20 per month. If you have five employees or less, Xero Standard is the best plan and if you have between six and ten employees, then you will need to sign up for Xero Premium 10. Unlike Wave, where you have to manually track all inventory purchases, sales and adjustments, Xero is capable of automatically tracking all inventory movements and calculations for you. For example, when you enter a bill from your supplier for inventory purchases, your inventory quantities and costs will automatically update. Similarly, when you create an invoice to sell products to a customer, your inventory will automatically decrease by the amount of the sale. Xero will do all cost of goods sold calculations for you behind the scenes to ensure your financial statements are automatically updated. If you have customers and vendors who are located in other countries, you will need to sign up for the Xero Premium 10 plan, which includes the multi-currency accounting feature. With this feature, you can create invoices, pay bills and manage bank accounts in multiple foreign currencies; Wave also includes multi-currency accounting. Xero and Wave include access to detailed financial reports so that you can stay on top of every aspect of your business finances. There’s no need to create a report from scratch—you can run a report with just a few clicks. Income Statement Report – summarizes income and expenses to show a net profit or loss for a specified period of time (e.g., a month, a quarter or a year). Balance Sheet Report – summarizes all assets, liabilities and equity for your business for a point in time (e.g., as of Oct 31, 20XX). Cash Flow Statement – shows cash coming in and going out of your business, including where it came from and how it was spent as of a point in time (e.g., as of Oct 31, 20XX). Unlike Xero, Wave has one pricing plan—free. You don’t have to provide your credit card information when you sign up for your Wave account. Best of all, you don’t have to worry if your bill is going to increase if you decide to add additional users. If you decide to hire an employee or give your customers the option to make online payments, you can easily add on services like Wave Payroll or Wave Payments. Keep in mind that both of these services will require you to pay a fee if you decide to use them. Similar to Xero, you can manage your entire accounts receivable process in Wave. Create professional invoices, send them to your customer via email and accept online payments. You can also run a detailed A/R aging report to stay on top of open customer invoices. Unlike Xero, you cannot automatically track your accounts payable balances in Wave. What this means is that you will be able to enter your bills into Wave, but when you are ready to pay that bill, you cannot print a check from Wave to pay that bill. Instead, you will have to make the payment outside of the system and then you can go into Wave and manually mark it as paid. This means that your A/P balances will not be up-to-date until you mark your bills as paid, whereas if you were able to generate a check, the bill would be automatically marked as paid like it is in Xero. However, you can run an A/P Aging report to stay on top of unpaid bills. Like Xero, you can give an unlimited number of people access to your Wave account. Not only is it free for you to use Wave, but you don’t pay a dime when you give your bookkeeper, accountant and anyone else access to your data! Like Xero, you can give your customers the option to pay their invoices online using a debit/credit card. Wave Payments is an integrated credit card processing feature that you can turn on and pay just 2.9 percent plus 30 cents per transaction to use. Once you turn this feature on, your emailed customer invoices will include a payment button that allows them to make an online payment. Unlike Xero, which includes full payroll processing in the Xero Standard and Premium plans, you need to add payroll processing to your Wave account. Wave Payroll offers two primary payroll processing options. One is a full service payroll option if you live in California, Florida, New York, Texas, Illinois and Washington. However, if you don’t live in one of these six states, you’ll have to go with the self-service payroll option, which means you will need to pay and file your payroll taxes on your own. However, Wave will make it easy by showing you how much you need to pay and how to file. Unlike Xero, which automatically tracks all inventory purchases and sales for you, if you decide to use Wave to track inventory, you will have to manually calculate all inventory movements. This includes all inventory purchases, customer product sales, and the cost of goods sold calculations. In addition, you will need to record all of this information by entering a journal entry to adjust your financial statements. Both Xero and Wave include a multi-currency accounting feature. Similar to Xero, Wave allows you to easily do business with customers and vendor suppliers in a foreign country. Wave can accept payments from customers in multiple currencies, you can pay vendor suppliers in a foreign currency, and you can manage foreign bank accounts in both Wave and Xero. Both Wave and Xero will do all of the exchange rate calculations for you to ensure your financial statements are accurate. Like Xero, you can produce a number of detailed reports to gain insight into your business. Xero and Wave include access to detailed financial reports so that you can stay on top of the overall health of your business finances. Wave includes customizable report templates so that you can run a report in just a few minutes. Income Statement Report – this report provides a summary of all income and expenses to show a net profit or loss for a specified period of time (e.g., a month, a quarter or a year). Balance Sheet Report – this report shows a summary of all assets, liabilities and equity for your business for a point in time (e.g., as of Oct 31, 20XX). Cash Flow Statement – this report shows cash coming in and going out of your business, including where it came from and how it was spent, as of a point in time (e.g., as of Oct 31, 20XX). Both Xero and Wave are very user friendly. While Xero might be on the moderate side when it comes to setting things up, it is very easy to navigate the program. 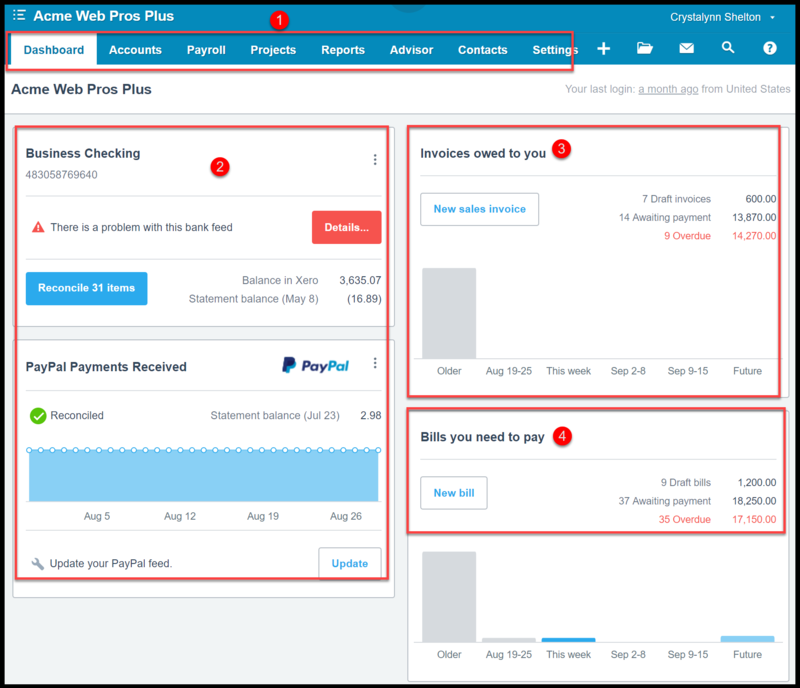 Xero also does a great job of using simple language like “invoices owed to you.” Wave is a lot simpler to set up and similar to Xero, it is very easy to navigate the program. Check out the snapshots we have provided below to see for yourself. Below is a snapshot of the dashboard you will see once you log into your Xero account. Very similar to Wave, key insights into your business finances are available on the Dashboard as soon as you login. Below, we have provided you with a brief explanation of the information you will find in the Xero Dashboard. Menu Tabs: Easily navigate to other areas of the program by clicking the menu tabs as indicated above. Bank Accounts: In this section, you will see a snapshot of all bank accounts you have connected to Xero, including checking, savings and PayPal accounts. You can connect all of your bank and credit card accounts to Xero so that your transactions automatically download. It only takes a few minutes to do this; watch our video tutorial on how to set up bank feeds in Xero to see for yourself! Invoices Owed to You: In this section, you will see a summary of all open customer invoices (A/R) which are divided into three groups: draft, awaiting payment and overdue. Bills You Need to Pay: This section includes a summary of the status of your bills, which are categorized into three groups: draft, awaiting payment and overdue bills. Like Xero, Wave has a dashboard that you will see once you have logged into your account. Key information such as your monthly income and expenses trend, and accounts payable and accounts receivable balances will display here. Below, we have provided you with a brief explanation of the information you will find here. Income and Expenses – At the top of the page, you will see a bar graph of the income and expenses for a 12-month period. You can easily adjust the time period. Payable and Owing – This section includes two columns, one for your A/R balances (the invoices payable to you) and one for A/P balances underneath the “Bills you owe” column. Net Income – In this section, you can keep tabs on how profitable your business is for the current year compared to the previous year without having to run a report. Figures are updated in real-time. 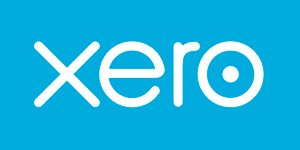 Neither Xero nor Wave offer live customer support. However, both include email support, and you can expect a response within a day or two. In addition, they both offer other great resources that include video tutorials and detailed help guides to assist you if you get stuck or have a question. As mentioned, Xero does not have the option to speak to a real, live person. However, they do have some great self-help options that I have found very useful: the Xero Business Help Center, Xero University, and a free Xero Course by Fit Small Business. Xero Course by Fit Small Business – This course includes 30 video tutorials with an average length of four minutes that cover how to set up your business in Xero, how to record sales, pay bills and run financial reports. Xero Help Center – A robust help center with video tutorials and step-by-step how-to articles on both basic and advanced Xero topics. Xero U (University) – Xero University includes video tutorial courses that you can take to learn how to use Xero. The topics are broken down into three user types (accountants, bookkeepers, small business owners) and are ideal for beginner, intermediate and advanced Xero users. As discussed, Wave does not offer any kind of live telephone or chat support. To get assistance when you need it, you will have to submit a support ticket by clicking on the help link within your Wave account. In general, you should receive a response within one business day. In addition, you can check out the Wave Help Center, where you can find how-to guides, video tutorials, and answers to frequently asked questions (FAQ) about Wave. Both Xero reviews and reviews for Wave Accounting are mixed. The negative reviews for both products centered around the fact that neither company offers live customer support like some of their close competitors, such as QuickBooks Online. Xero reviews show that users like how easy the program is to navigate and set up. In addition, the inclusion of payroll processing for up to ten employees at no additional charge is also another feature users like. On the negative end, users feel that Xero should offer live customer support as opposed to email support. You can read all of our user reviews on the Xero Reviews page. Wave Accounting users like the ability to manage their books, free of charge. They also like that they can give an unlimited number of users access to their books for free. Similar to Xero users, customers would like to have access to a live person they can contact when they need help as opposed to sending an email and waiting for a response. You can read all of our user reviews on the Wave Reviews page. By now, you should be leaning towards either Xero or Wave Accounting. If you can’t afford to invest in an accounting software right now, go with Wave Accounting. On the other hand, if you’re looking for an accounting software with few limitations that will easily grow with you when you hire employees or add new users, go with Xero. Getting started with Xero is a piece of cake. Just head over to their website and provide a few contact details about your business. Your account will be set up immediately and you can start tracking your business finances right away. Don’t forget about our free Xero Course, which will help you get up to speed pretty quickly.